Trailing the wave of revolutions that began sweeping through the Arabic-speaking Middle East this January, I recently traveled in the region, visiting some of the capitals where what we have come to call the "Arab Spring" has hit. In Cairo, I kept company with the handful of Egyptian political activists from the social media generation who were skeptical of a revolution that had already started to show its populist roots. In Manama, I met with members of the mainstream opposition movement who contended that, contrary to their government's claims, the Shiites of Bahrain wanted nothing to do with Tehran: In the 1970 U.N. poll about the emirate's future, Bahrainis expressed the wish to remain part of an independent Arab state under the ruling al-Khalifa family but demanded their political rights—and still do. And from Beirut, I watched another uprising kick off over the anti-Lebanon mountain range in Damascus as many Lebanese quietly hoped that the revolution there would do away with the Assad regime while fearing the repercussions could not help but come back on them. 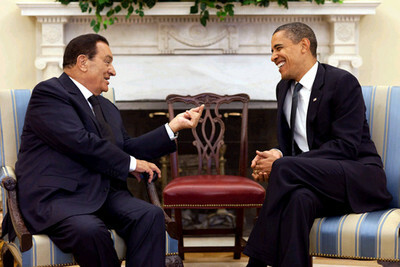 By deserting Egypt's president Mubarak (left, in the White House, August 18, 2009), President Obama condemned the peace process to failure, for it was lost on no one in the region that the man who kept the peace with Israel for more than thirty years was trashed when the pride of the U.S. president won out over U.S. national interests. After a month in North Africa, the Levant, and the Persian Gulf countries, I am still unsure what these uprisings have in common, if anything. The regimes that suffered these blows are themselves different from place to place, for all authoritarian regimes are authoritarian in their own way—Husni Mubarak was no Saddam Hussein, nor even a Bashar al-Assad. Perhaps our eagerness to see the upheavals as one wider movement is less a representation of reality than a reflection of how the Middle East is understood by large segments of the American intelligentsia—a habit of mind that of late was most powerfully expressed by President Barack Obama. It was during the June 2009 Cairo speech, after all, where Obama transgressed the borders according to which Washington maintained and advanced its interests, describing the region in terms of Muslims, a Muslim world that is by definition borderless, transnational, and not specific to the particular circumstances of history, geography, and politics that give nation-states their character. Obama's Muslim world is amorphous, more like a sentiment than a physical fact, something perhaps similar in nature to the "Arab Spring." It has been argued that the recent events were driven by economic motives, insofar as all these revolts pitted the have-nots against the haves; and yet the particular circumstances vary greatly. There is little comparison, for instance, between the grand prize up for grabs in Libya's civil war (control of the country's oil) and the fairer employment, and educational and housing opportunities sought by the Bahraini opposition. Furthermore, the blanket charge of corruption against economic elites across the region obscures the genuine reforms that won the Tunisian and Egyptian regimes high marks from the World Bank and the International Monetary Fund (IMF). The onetime, popular notion that all these opposition groups are united in their calls for democracy is starting to fade in light of the evidence. It seems, for instance, that the Libyan rebels comprise a large component of violent Islamists, some of whom fought against U.S. forces in Iraq. There is concern that parts of the Syrian revolution are also spearheaded by Islamists, and there is little doubt that the fall of Egyptian president Mubarak will give more power to the Muslim Brotherhood. And even the very model of the Arab democracy activist, that young, middle-class, social-media-mad Egyptian, has begun to look different than when he first took to Tahrir Square on January 25. In their demands for retribution and revenge against the scions of the late regime, the Egyptian activists seem less inspired by the rule of law, due process, and other features of liberal democratic reform for which they petitioned and protested, than by the tradition of modern Egyptian populism, from Saad Zaghloul to Gamal Abdel Nasser. As for the revolutionaries themselves, there is no consistent profile from country to country or little to suggest that their different resumes make them necessarily sympathetic to each other's goals. To be sure, the Tunisian activists found common cause with their Egyptian counterparts, explaining to them how to use the social media to get people to take to the street. As Lebanese journalist Hazem al-Amin told me in Beirut, "The first time the Tunisians tried, they failed. That was back in 2008, and this time they were prepared." And yet Muhammad Bouazizi—the iconic figure of the "Arab Spring" whose self-immolation triggered the Tunisian revolution—seems to have had little in common with the Libyan rebels, who unlike every other opposition movement, took up arms against the ruling order almost immediately. The sectarian divisions between the opposition movements are also noteworthy. While the moderate mainstream of Bahrain's Shiite opposition has earned the admiration and support of Hezbollah, the Syrian uprising's Sunni current has cursed this same terrorist organization, sponsored by Damascus's Alawite regime, from the outset of their demonstrations. The ostensible sources underlying the revolutionary eruptions are equally myriad. Many point to social media, like Facebook and Twitter, which served as a billboard and meeting place for opposition movements. And yet some argue that it was the Mubarak regime's ill-considered decision to shut down the Internet and mobile phone service that really filled the streets of Cairo. As Egyptian political analyst Amr Bargisi told me as we walked through Tahrir Square in early spring, "If your mother can't reach you on the phone, she is going to send your brother down to look for you." Others point to broadcast media, especially al-Jazeera. However, even as this instrument of Qatari foreign policy assiduously covered the uprising against Mubarak, a Qatari adversary, it was virtually mute when turmoil first started brewing in Syria, an ally. Given Riyadh's fears that the revolutionary wave might eventually crash on Saudi Arabia, al-Arabiya, the majority Saudi-owned satellite network, has been only a little bit better on the Syrian protests and all but ignored the opposition to the government of Bahrain, a Saudi ally. Many Shiites in the region are of the opinion that it was the 2003 invasion of Iraq that inspired the "Arab Spring." For some, the end of a Baathist regime that had persecuted Shiites marked an almost millenarian turning-point for the Middle East. In Beirut, independent, anti-Hezbollah, Shiite activist Lokman Slim told me that "the toppling of Saddam's statue made many things seem possible that seemed impossible before." Others in Lebanon claimed it was their own 2005 Cedar Revolution that led the way—even as the March 14 pro-democracy movement has suffered a major setback with Hezbollah's de-facto takeover of the government this January. And yet others pointed to Hezbollah's Iranian sponsor as inspiration. "The 1979 Islamic Revolution first proved to people that they could change their own rulers," one young Shiite activist told me in Bahrain. If success has many fathers, it will be some time yet before anyone knows whether the "Arab Spring" was a success or instead turns out to be a series of failures. In fact, it is not even clear what has really changed. Consider that Tunisia and Egypt, the two countries where the rulers were actually brought down, merely witnessed direct military takeovers of what were already military security regimes. Hence the various and often conflicting narratives surrounding events seem to suggest that the "Arab Spring" is a misnomer. The belief that there is some deeper trend underlying the recent wave of political upheaval in the region, something uniquely Arab tying them all together, is of a piece with the discredited pan-Arab notion that the three hundred million inhabitants of the Arabic-speaking Middle East constitute a unified Arab nation. To most Americans, the reality of Arab disunity was laid bare most recently when Shiites and Sunnis slaughtered each other in post-Saddam Iraq—a reality reinforced, paradoxically, by the "Arab Spring." If the tendency is to see this string of uprisings as a pan-Arab enterprise linking Arab publics across borders, then the uprisings have further underscored the fractious character of the region. In effect, the "Arab Spring" is a series of civil wars, sectarian and tribal conflicts, and divisions not only between the political elites and the people but also within certain regimes themselves. In other words, as of yet there has been no fundamental shift in Arab political culture. Where some have argued that the Arab publics have been empowered with their newfound voice, the truth is that Arab officials have long had to reckon with the power of the masses, especially when manipulated by talented demagogues like Nasser, lest they wind up butchered by the mob in the streets of their capitals, as was Iraqi prime minister Nuri Said in July 1958. Moreover, the additional power of the street and its ability to bring down rulers will come at the expense of actual democratic reform. For one thing, the regimes will ignore calls to reform, from both their own populations and Washington, in the conviction that reform is simply another word for the weakness that brought down Mubarak. For another, the activists themselves may find democracy less conducive to their ends than populism. As the young Egyptian activists have shown, they can wield more power from the pulpits of Tahrir than by participating in parliament. But if little has so far changed in the region, it is a very different matter for U.S. policymakers. Even though the dust is far from settling in the Middle East, in Washington the picture is already starting to become clear. The U.S. position in the region, an area of vital interest since the end of World War II, has been weakened. The erosion has taken place gradually over time and is a factor of many forces not attributable to any single episode or administration, but one can nonetheless identify a defining moment—Obama's Cairo speech. For more than half a century, Washington had been accustomed to dealing with the Middle East, its allies and adversaries alike, in terms of nation-states, discreet political units with their own interests and internal makeup. U.S. policymakers were less concerned with the desires and aspirations of Arab peoples than with those of their authoritarian regimes. If to many Arabs this seemed cruel and hypocritical coming from one of the world's oldest democracies, the fact is that the most salient feature of the modern international system is that states deal with states whether those governing institutions are elected by their free citizens or imposed by powerful ruling cliques. To deal instead with opposition forces is by definition an act of subversion, or more spectacularly, war. And yet as it turns out, despite all the repression suffered at the hands of their authoritarian regimes, the Arab masses would have their voices heard by the Americans on 9/11. In retrospect, it is clear that the attacks themselves were less significant than how this monumental episode of anti-U.S. violence was received around the region. It is interesting to speculate how the Bush administration might have responded had the 9/11attacks been condemned, and terrorism and extremism in all its varieties isolated and targeted both by the Arab regimes and the Arab masses. But because the bloodshed of innocent civilians was justified and celebrated, from North Africa and the Levant to the Persian Gulf and Pakistan, it was difficult for U.S. policymakers not to conclude that the furies were endemic in the region and needed to be addressed as such. The Bush administration saw the issue as a political pathology, one that could be solved by importing democracy to the region, beginning with Iraq, which would be a beacon unto its neighbors. The Obama administration, partly to correct for a predecessor deemed wildly unpopular at home and abroad, took another view and tended to see popular Arab anger at the United States as the product of legitimate grievance. Hence it believed that by pressuring Israel to accommodate Arab demands, it would win the approbation of the Arab and Muslim masses. The practical effect of both administrations was to set political precedents that reflected a sea-change in U.S. political-strategic thinking, namely that the Arab states were no longer Washington's primary interlocutors but rather its regional problem. The solution was to go over the heads of Arab rulers and make Washington's case directly to the Arab peoples. There was, however, a big difference between the two presidents: Bush made war against an Arab adversary while Obama undermined a U.S. ally. The main flaw with Obama's Cairo speech is not simply that it contravenes the norms of political and diplomatic practice or that the belief in the existence of a unified Muslim world ignores the reality of 1,400 years of Muslim sectarianism; nor is it that the leader of a secular republic should avoid categorizing the world's inhabitants by their religious beliefs. No, the biggest problem is that Obama played into the strategic communications campaign of Washington's chief regional adversary, the Islamic Republic of Iran. For it is Tehran that insists that for all their divisions (Sunnis versus Shiites, Sufis versus Salafis, Arabs versus Persians, Africans versus Asians, etc. ), there truly is one factor uniting all the world's Muslims: resistance to the United States and its regional allies, Israel as well as the Sunni states such as Jordan, Saudi Arabia, and Egypt. But while Washington's relations with these states and others constituted the cornerstone of U.S. Middle East policy, by describing the region as an amorphous body of believers (an umma of sorts), Obama strayed into a minefield without a map—or no map other than the one that confirmed the Iranian view of the Middle East. If Tehran loses its one Arab ally in Damascus, the score may be somewhat evened. But so far, only pro-U.S. regimes have fallen, in Egypt and Tunisia, and the Iranians have already benefited from a number of subsequent U.S. errors. To begin, in Libya the White House has entered into a conflict whose outcome may be important to the Europeans but would have had very little effect on U.S. interests—unless Washington decided to intervene. Now that it has, the danger is that Washington may be bound to its European allies in a stalemate or forced to sacrifice prestige by eating its words and acknowledging Qaddafi's restored legitimacy to rule. A testament to the administration's confusion is the description of its support of armed Libyan rebels as a humanitarian intervention while other peaceful opposition movements such as Syria's have failed to win any support from Washington. Hillary Clinton excused this difference by the Libyan regime's firing on its subjects from airplanes. The secretary of state obviously did not mean to imply that so long as the Syrians eschewed the use of fixed-wing aircraft they were safe from U.S. intervention, but that is how Damascus understood it and so used tanks against Syrian civilians. The Libyan adventure is not about humanitarian causes. Rather, as some analysts have explained, Obama and key aides saw Libya as an opportunity for the administration to fold U.S. power into a multilateral dispensation. If the commander in chief believes that unilateralism, or unbridled U.S. power, which Bush was wrongly faulted for, is a danger both to the world and to the United States itself, the fact remains that the White House has intentionally hobbled U.S. power and prestige to put them at the service of European interests. As for events in Bahrain, the White House failed to keep a tight rein on two key U.S. allies—the governments of Bahrain and Saudi Arabia. By turning a blind eye to the entry of a 4,000-strong, Saudi-led Gulf Cooperation Council force that has helped the Bahraini security forces terrorize the local Shiite population, Washington has paved the way for the Iranians to lend comfort and perhaps eventually material support to their coreligionists. Even before the Bahrain uprising, Washington had shown its inability to manage the Saudis, who crossed U.S. interests in Iraq and Lebanon by cozying up to Damascus, temporary alliances that strengthened Tehran's hand in both Baghdad and Beirut. There was little chance Riyadh was inclined to heed Washington's counsel regarding Manama since the Saudis are still fuming over Obama's treatment of Mubarak. The key issue then is Egypt, arguably the cornerstone of the U.S. position in the Middle East for more than thirty years. The peace treaty with Israel was not only a corollary of Cairo's shift from the Soviet camp to Washington's side but also neutralized the largest and most influential of Arab states and made a full-scale regional war with Israel many times less likely. Since then, Egypt has served as a sort of U.S. trophy, an example of what other Arab states could have—money, arms, and prestige—if they simply made peace with Israel. And it was that treaty that turned Washington from a great power into a power broker—U.S. support for Israel proved to the Arabs that if they wanted anything from Jerusalem, they would have to come through Washington to get it. If Obama seemed to understand the centrality of Cairo, the sticking point, according to reports at the time, was the president's sense of personal honor. How, he asked aides, could he not support the aspirations of the Arab and Muslim masses that he himself had promoted and praised in his Cairo speech before the very same audience that was now out in the streets demanding Mubarak's ouster? The conflict between national duty and personal gratification is one of the perennial trials scoring political life since the beginning of recorded history. The Hebrew Bible and the Greek and Latin epics document that there can be no marriage between the two, no compromise; for the essential test of the statesman, failing which he cannot be one, is to come down on the side of the national interest. As Obama could not choose between Dido and Rome, he dithered, making a series of mistakes that showed that the administration was caught unaware—by a popular insurrection whose pattern fit perfectly with the essential message of the Cairo speech. For what allegiance did Egyptians owe their president when Obama had approached them directly in terms of their political loyalty to the umma? What the regime actually stood for, or the fact that the protestors greeted the army like brothers when it actually was the most corrupt institution in all Egypt, as well as Mubarak's real flaws and successes—including an economy that had grown steadily at 7 percent for more than half a decade—were all irrelevant. The Egyptians were part of something larger—the "Arab Spring." Would Obama side with the activists—as the American press blithely ignored or suppressed the anti-American and anti-Israeli sentiment during the protests—or would he stand with an ally that undergirds the U.S. position in the Middle East? For Tehran, there was no contradiction to smooth out. The mullahs could congratulate the Egyptian and Tunisian peoples on their great successes in tossing out their rulers even as they ruthlessly repressed their own opposition movement and helped Assad put down his own. The administration knew neither its own interests nor policy. Mubarak's naming a vice president and his promise to step down after the autumn elections was precisely what U.S. policymakers had sought from the Egyptian leader for nearly a decade. Had the administration pocketed that as a victory, the situation would have looked very different. Instead, the president seemed to make a fetish of consistency; Mubarak, Obama announced, had to go. Nor, for that matter, is there anything obviously consistent about demanding that U.S. ally Mubarak step down while tacitly supporting Assad, whose security services were responsible for the deaths of U.S. soldiers in Iraq as well as of U.S. allies in Iraq, Lebanon, Israel, and the Palestinian territories. Having warned Damascus to refrain from violence against protestors, Obama drew a moral equivalence between the regime and its unarmed opposition by admonishing demonstrators to avoid shedding blood. The reason the administration has shown Assad so much favor is no secret: Obama needs Damascus to sign a peace treaty with Israel, with which he means to win the affection of the Arab masses. The rather inconvenient truth is that an Arab-Israeli peace process no longer exists. To be sure, as animals for slaughter survive the deathblow standing on all fours for moments before succumbing, many Washington policymakers on both sides of the aisle continue to insist on the centrality of finding a solution to the Arab-Israeli conflict. But there will be no takers on the Arab side. It was lost on no one in the region that the man who kept the peace with Israel for more than thirty years at some personal risk to himself was trashed by Washington when the pride of the U.S. president won out over U.S. national interests. In other words, the administration is not yet aware that the centerpiece of its regional strategy, Arab-Israeli conflict diplomacy, is no longer relevant. Egypt's future is unclear, but there is little consolation in the fact that the Egyptian army seems not to want another war with Israel or to lose $2 billion a year in U.S. aid. The decisions made by the rulers of modern Egypt, from King Farouk to Nasser, have often been driven by domestic, regional, and international dynamics beyond their control. Even as there is no longer a contest between superpowers played out in the Middle East, the regional competition is as heated as ever, given Iranian and Turkish ambitions. Cairo's permitting two Iranian ships to pass through the Suez Canal for the first time since the Iranian revolution is a taste of things to come, for the Egyptians will continue to test Washington's resolve and mettle. For thirty years, thanks to Mubarak, war between Egypt and Israel, two U.S. allies was unimaginable. So far, all Washington has reaped from the uprisings in the Middle East, the "Arab Spring," is the whirlwind. Lee Smith is a senior editor at The Weekly Standard and the author of The Strong Horse: Power, Politics, and the Clash of Arab Civilizations (Doubleday, 2010). See, for example, Christopher Boucek, "Dangerous Fallout from Libya's Implosion," The Carnegie Endowment for International Peace, Washington, D.C., Mar. 9, 2011. Microsoft Network News, Apr. 8, 2011. The Guardian (London), Jan. 25, 2011. BBC, "On This Day, July 14, 1958," accessed Apr. 25, 2011. Stanley Kurtz, "Samantha Power's Power," National Review Online, Apr. 5, 2011. Jackson Diehl, "Amid the Mideast Protests, Where Is Saudi Arabia?" Feb. 25, 2011; Yahoo News, Apr. 18, 2011. The New York Times, Feb. 12, 2011. The Washington Post, Feb. 2, 2011. Michael Doran, "The Heirs of Nasser," Foreign Affairs, May/June 2011. Related Topics: Middle East politics, US policy | Lee Smith | Summer 2011 MEQ receive the latest by email: subscribe to the free mef mailing list This text may be reposted or forwarded so long as it is presented as an integral whole with complete and accurate information provided about its author, date, place of publication, and original URL.